The locals call the area the ‘Switzerland of America’, and with good reason. The Uncompahgre wilderness is a treasure trove of jagged peaks and wildflower strewn alpine tundra in the northern San Juan mountains. The northern and central portion of the wilderness contains a series of north-south trending drainages separated from each other by banded cliffs and razor-toothed peaks with fanciful names like Precipice peak and Courthouse mountain. Further south, a wonderland of high altitude alpine meadow known as the ‘American Flats’ beckons. The Uncompahgre (also known as ‘Big Blue’) is not as well known as its neighbors to the south and west (Weminuche, Sneffels, Lizard Head) mainly due to its distance from the big cities. For the solitude seeker, Uncompahgre offers an escape from the crowds. The best weather and trail conditions occur in mid-to-late July. During the month of August heavy rains can occur and require careful monitoring of the weather forecast. Fall colors are best during the last week of September. The best aspen viewing is on the northern boundary of the wilderness close to Owl Creek Pass Rd. For more information about Colorado wilderness weather visit the Colorado Backpacking Guide. 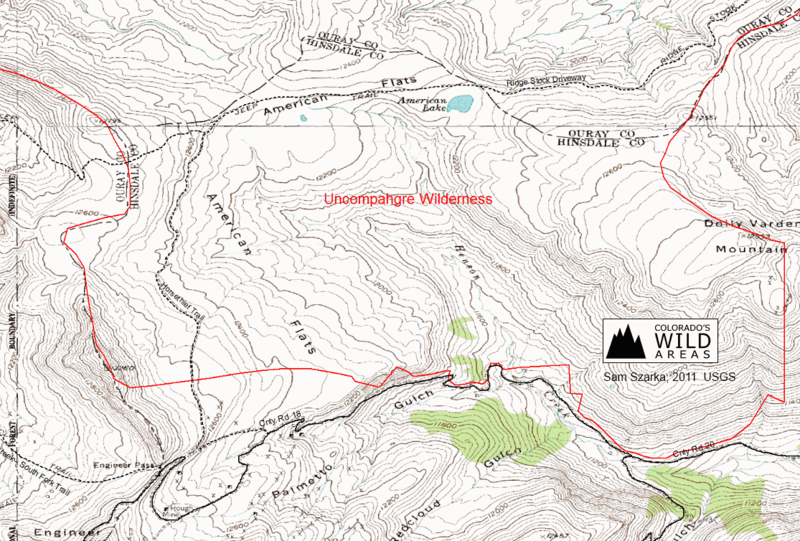 Uncompahgre is located just east of the town of Ouray, CO. Wilderness access is from the northern boundary via Hwy 50 or the southern boundary near Lake City, via Hwy 149. 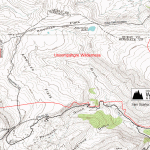 Uncompahgre Peak Trail – Uncompahgre Peak is recognized as an easier fourteener summit climb. Access to the Nellie Creek Trailhead is via forest service road 877. Leave Lake City via County Rd. 20. Rd 877 will be on the right hand side when heading west. 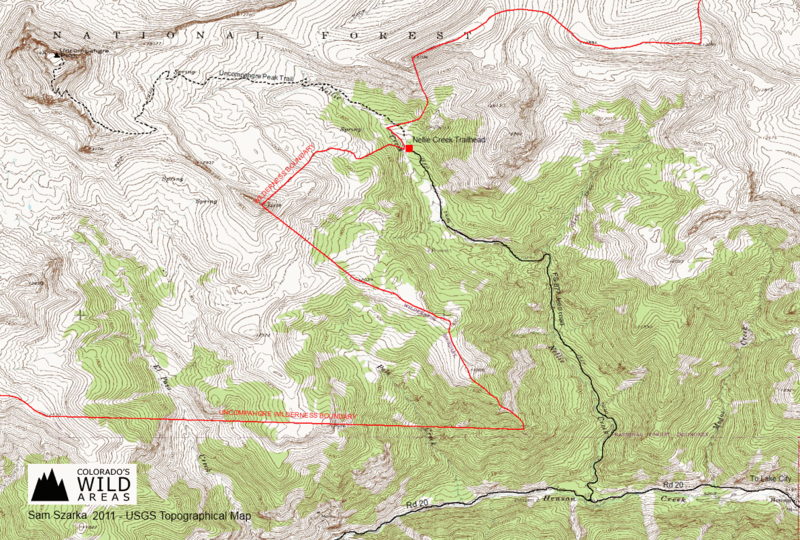 This USGS topographical map shows the Uncompahgre peak trail as well as the access road to the Nellie Creek trailhead on the boundary of the wilderness. Download the trail map here or by clicking the image. Horsethief Trail – American Flats – Offering superb Rocky Mountain high altitude wildflower viewing, the American Flats trail is an easy hike with very little elevation change. From Lake City, head west on Cnty Rd. 20 onto Cnty Rd. 18 headed to Engineer Pass. The trail begins very close to Engineer Pass. 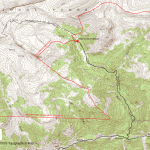 This USGS topographical map shows the Horsethief trail as it connects with the Ridge Stock Driveway trail in the southern Uncompahgre Wilderness. Powderhorn Wilderness, Weminuche Wilderness, Mt. Sneffels Wilderness, West Elk Wilderness, Black Canyon of the Gunnison – Find more Colorado wilderness areas.